Drag a UICollectionView to storyboard. 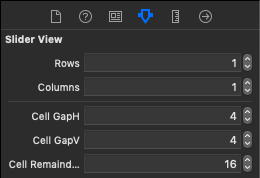 Open Inspector panel, change class to QKSliderView. Open Inspector panel, update neccessary properties such as total number of rows, columns etc. QKSliderView is available under the MIT license. See the LICENSE file for more info.